Chinese tea may be classified in many ways. 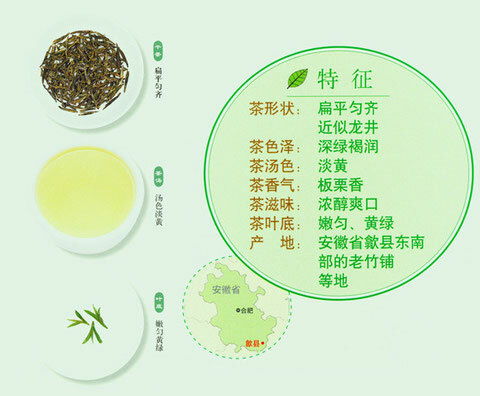 Categorizing according to processing techniques, Basic tea includes green, yellow, white, Oolong, black and dark tea. Green tea is the c to nature among all tea types.Green tea is the earliest tea processed and consumed It accounts for approximately 70% of China’s total tea yield international green tea market, China’s contribution is 70% or greater. Biluochun Tea is one of the ten most famous teas in China. It is locally known as "Fearful Incense" due to the strong aroma of the brew!The technique for collecting tea leaves is very complex. Only the tender tip of the leaf is used for the tea making process. This part of the leaf should be no longer than one inch long and shaped like the tip of a spear. One tin of tea uses 60 thousand spears! It's no surprise then, that some of the finest Chinese teas are very expensive. The next step in the process is to repeatedly knead, rub and roll the leaves by hand. The Biluochun tea involves a particularly labor intensive process but the end result are leaves that are compact, tender and wonderfully fresh and aromatic. Longjing Tea is one of the ten most famous teas in China. It is said that Longjing tea is the beauty among all the tea, while the Xihu Longjing tea is the most beautiful among the Longjing tea. Xihu in Hangzhou, is the favorite place for the intellectuals from the ancient time to now, as a result Xihu Longjing tea has combined not only the green color, the strong fragrance, aromatic taste and beautiful shape, but also with the famous mountains, temples, lakes, springs and tea which are famous in it. 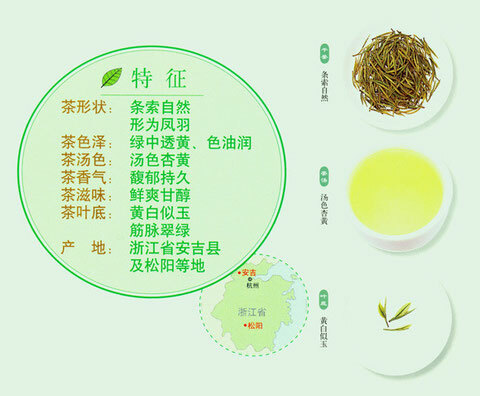 From one cup of Xihu Longjing tea you can surely feel the traditional and proud culture of Longjing tea. 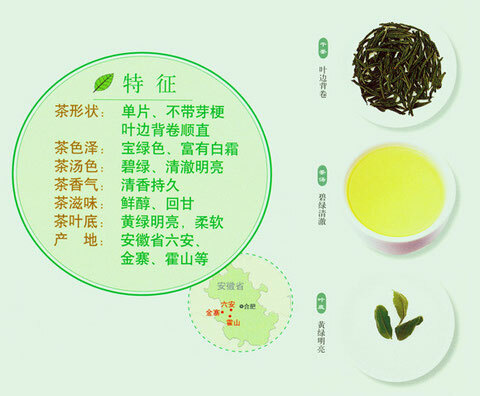 Guzhu Zisun tea is green tea, traditional tea of Zhejiang. Guzhu Zisun tea also called Huzhou Zisun, Changxing Zisun. Guzhu Zisun tea produced in Guzhu village of Changxing County,China’s Zhejiang Province, famous as early as 1200 years ago. The name Zi Sun means "Purple Bamboo Shoot", so called because the unprocessed tea leaf is partially purple in color and its slim, narrow shape resembles that of a bamboo shoot. An Ji Bai Cha is one kind of green tea and One of Zhejiang’s “Ten Famous Teas”! 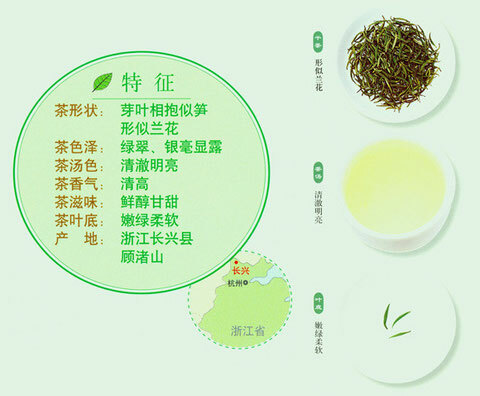 The spring tender shoot leaf is white, and from white gradually turn into white green, summer autumn tea become green. Its amino acid content higher than ordinary green tea for more than 2-3 times! 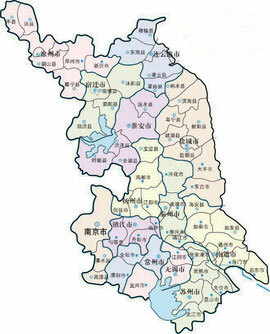 Anhui is a province with many well-known teas. 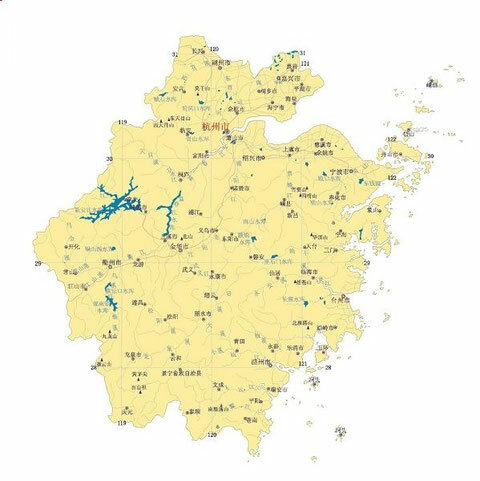 60% of Anhui is covered with mountains, and its subtropical climate provides an ideal environment for tea to grow. 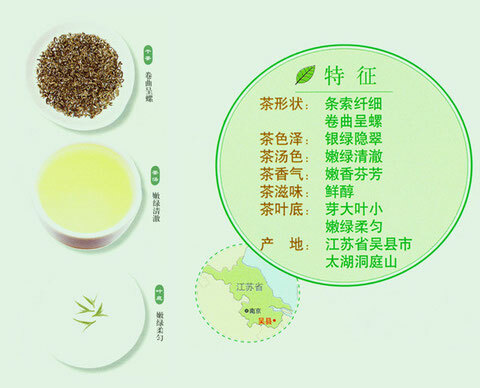 Green tea production of the province ranks the fifth in China. Liu’an Guapian Tea is one of the ten most famous teas in China. Liu’an Guapian is a band of famous tea with a long history, and it originates in places like Qiyun Mountain in Lu’an District, Anhui Province. It distinguishes itself among the other famous tea for the endemic species of local area, and the collecting technology and its processing arts and crafts, thus forming its unique style. It is the only kind of flat tea without stem in green teas, and its shape looks like the seed of melon, its color is verdure, its fragrance is thick and its taste is sweet. It can not only help to eliminate the hotness and satisfy the thirsty, but also the digestion. Consequently, it is regarded as a treasure. Laozhu Dafang tea is stir fixation green tea, the history tea of Anhui. According to legend, as early as the song and yuan years, old bamboo ridge on the ancient temple, lived a call Ding Gu monks. He burned incense to entertain the guests of the heart, the kind of homemade to tea for drinking, Ding Gu Da Fang tea on the name. The qing dynasty was classified as "gong tea".